Deckscape set up. Yes, this is about the easiest setup ever. Dr. Thyme has invited you, one of his best students, to a special laboratory test. But oh no–there seems to be a malfunction, and now you’re stuck in the laboratory without any inkling of a way out. Can you escape in the time provided? Or will you be stuck in the laboratory forever? Deckscape: Test Time is a cooperative card-based tabletop escape room for one to six players. Players are students of Dr. Thyme who must solve puzzles as part of his test. If they can escape the laboratory in an hour, they win. To begin, players place the deck of cards on the table, remove the top card when they’re ready, and begin reading. 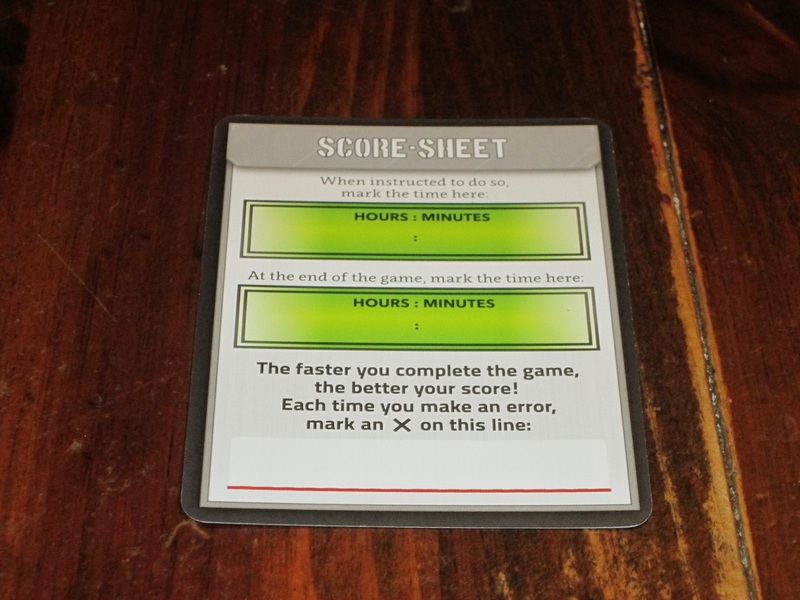 Players will need paper and pencil as well as a way to keep track of time. 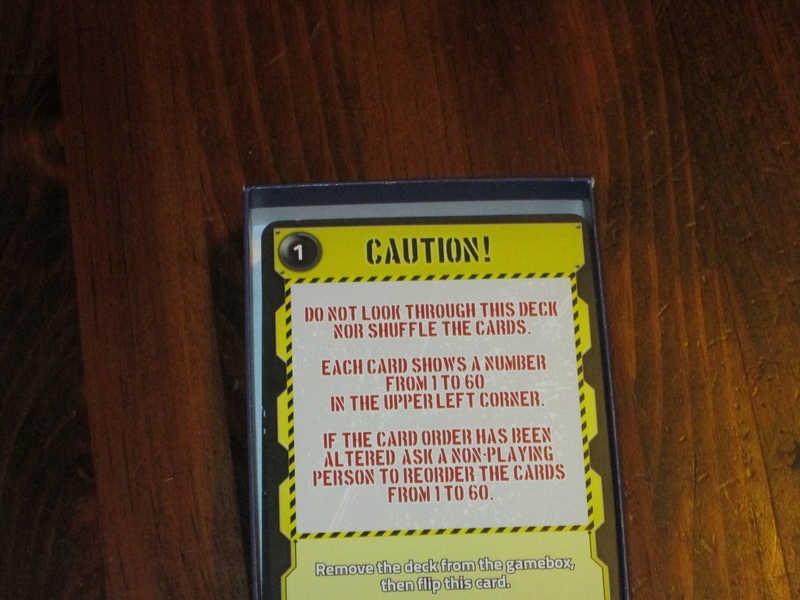 In Deckscape, players will read the instructions on the cards, which reveal how to set up the game (usually by dividing the deck into a number of stacks with only the top card showing). Play is simultaneous as players work to solve puzzles. Each card has a large illustration on it and a prompt that tells when to flip the card. Item cards flip immediately and the players get to use them. Puzzle cards can be turned over when the players think they know the answer to the puzzle. 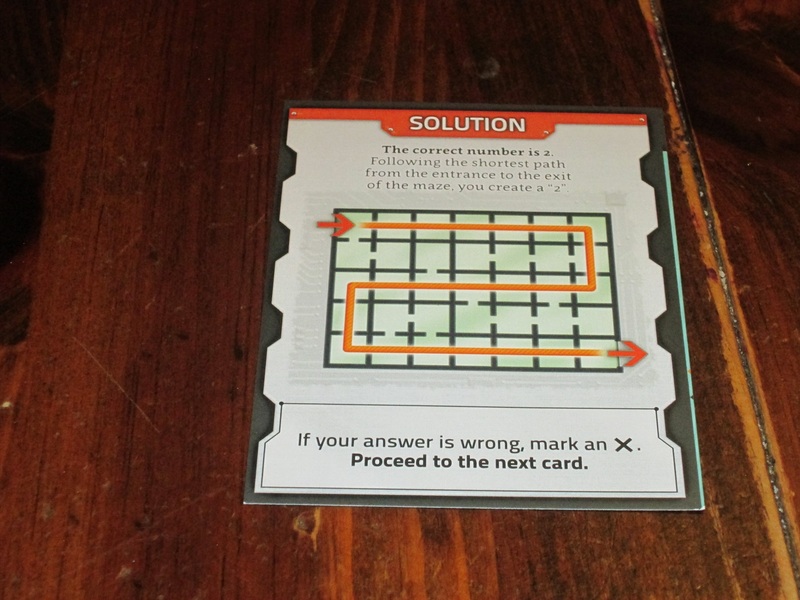 (The back of the puzzle card reveals the answer as well as the rationale for that answer.) If players get a puzzle card correct, they move on to the next card. If players get a puzzle incorrect, they mark an X on the included score sheet, which will give a time penalty at the end of the game. If players try to solve a puzzle before a necessary item to solve that puzzle is available to them, they take an additional X. Once the players have made it to the bottom of all the stacks, they check their score. Their score is their base time plus five minutes per X. They compare their final score against the included table to see if they won. Deckscape is Italian publisher dV Giochi’s entry into the escape room scene, and judging from this first effort, there is huge potential for the system. Note: this review contains no spoilers. Pictures in this review are of non-spoiler components and an additional tutorial that is not included in the standard deck box. 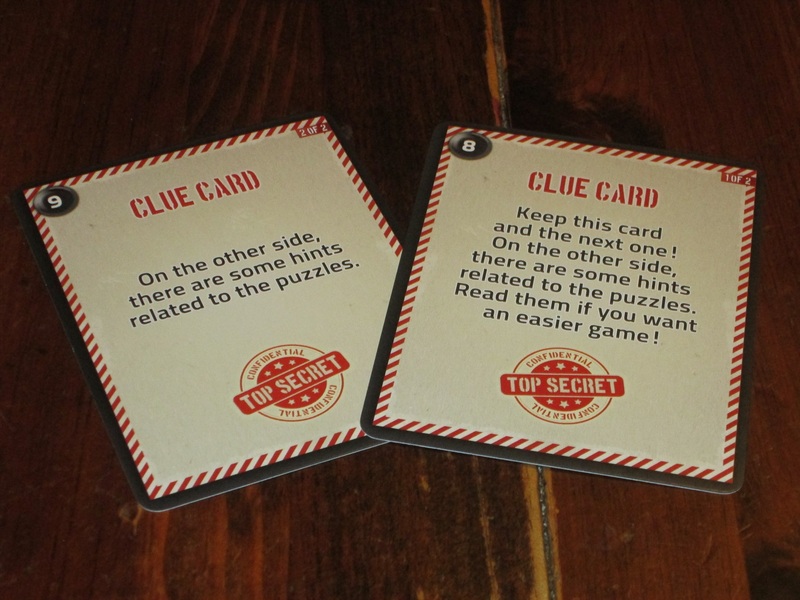 Clue cards will help players on the harder puzzles. 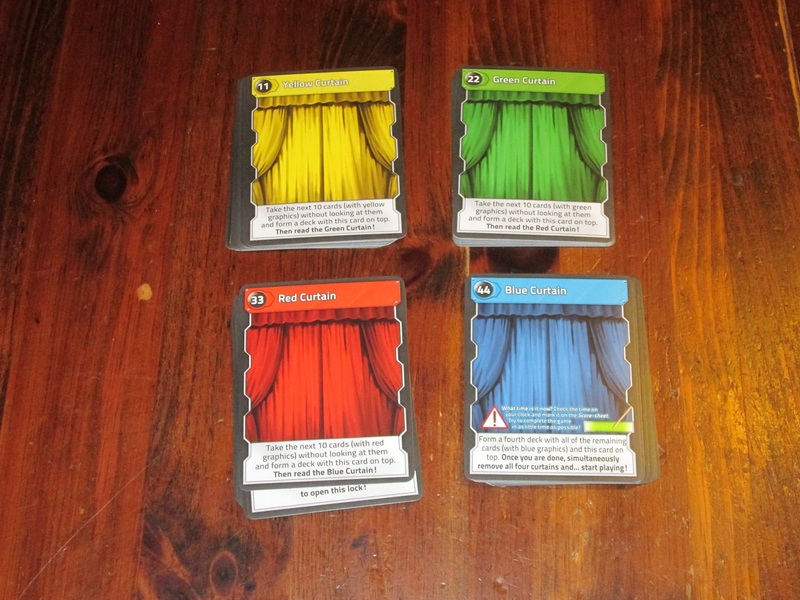 One of my favorite aspects of the Deckscape system is simply its portability. The game comes in a small card game box (think No Thanks! or Coloretto), meaning it’s nearly pocket sized. You can carry this game just about anywhere, which is a huge boon. 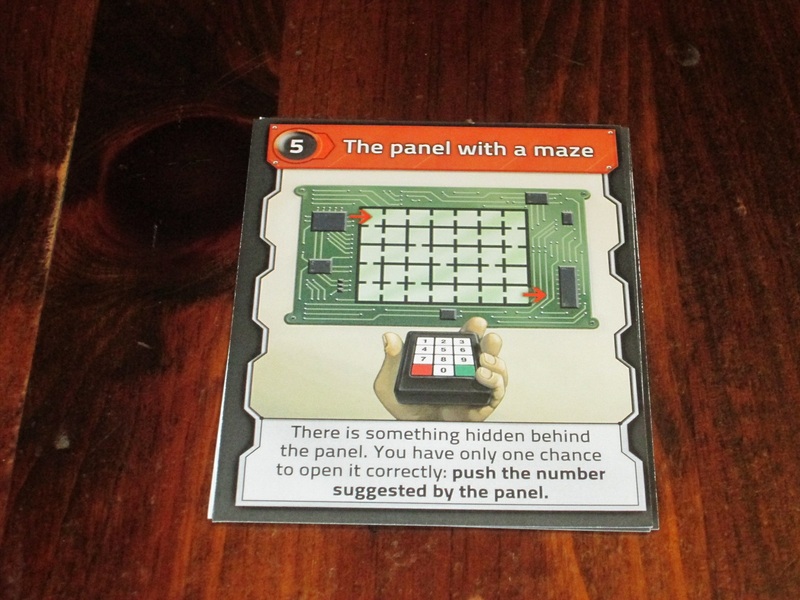 Yet despite the small size of the box, the cards are large enough to display the detail necessary for the tantalizing puzzles of an escape room. The cards look like they’re the size of two playing cards side by side, which is an odd size for sleeving but a great size for finding clues. One of the puzzles in dV Giochi’s promo introduction to Deckscape. Can you figure it out? Deckscape uses a very novel (and incredibly simple) method for solving puzzles. Kosmos’ Exit series, for example, has players check a three-digit code with a decoder wheel each time they solve a puzzle; Space Cowboys’ Unlock! has players add numbers together or enter a four-digit code into the app. Both of these methods are sound, and most of the time they work well, but they are limiting in the kinds of puzzles they can offer; every solution must yield the same kind of outcome. Deckscape, by contrast, is open-ended in its solutions. Each card shows a picture and has a prompt at the bottom, asking players what they should do. Once they discover the solution, they flip the card and see if they’re right. This is a really cool way to offer a broad range of puzzles and to avoid shoe-horning every puzzle into the same structure. It’s an elegant way to broaden the scope of what’s possible. Here’s the solution to the puzzle. Did you get it right? As cool as this out-of-the-box method is, it is also Deckscape’s greatest weakness, because while the illustration/prompt system provides for lots of different puzzle opportunities, since the game is just cards, if you completely miss what a puzzle is about, it’s difficult to get back on track. With Unlock! and Exit, the code system, while occasionally feeling forced, is itself a clue when you get stuck. You know that at the end of this puzzle, you should have a three- or four-digit code to test whether you’re right, and you’re able to test it multiple times. There’s a trial-and-error process that might eventually help you discover what you should be doing. This framework narrows the scope of possible answers because you know that you won’t be inputting something that isn’t a series of numbers. With Deckscape, the prompts can be much broader, meaning that if you aren’t on the same wavelength as the designers, a guess at the answer can feel like a shot in the dark. 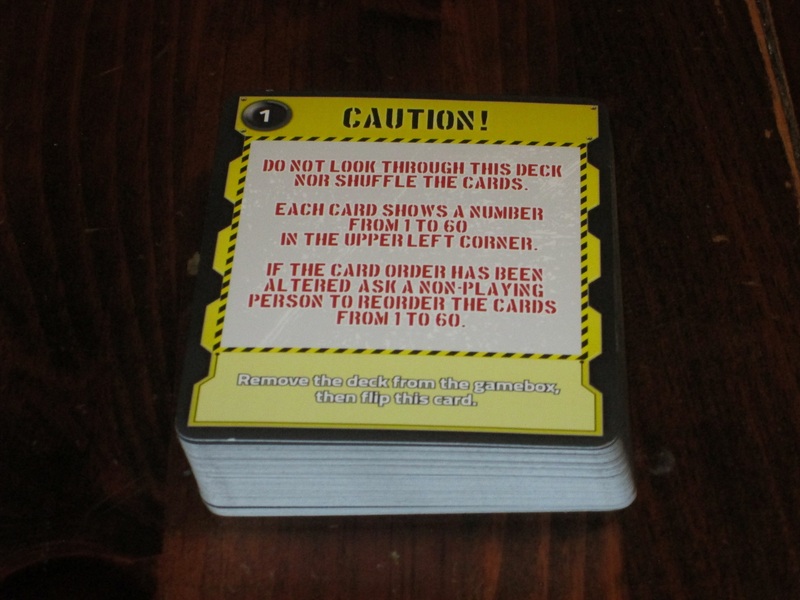 Early into Deckscape, the deck splits into multiple stacks so players can make their own way through the escape room. And that’s a little how we felt once we finished Test Time. We had enjoyed ourselves, but my wife said, “It felt like we were blindly guessing more than we usually do.” I think part of this was unfamiliarity with the system–once you get into the puzzles, it takes a little while to discern the rhythm of the game–and part of this was how easy it was simply to guess and move on. All you do to guess is turn over the card, and the only penalty you receive is an X. I think we were more cavalier in taking penalties than we might have been otherwise, and our MO in escape rooms is to test lots of possibilities until we discover what’s right, a door that is closed in Deckscape. 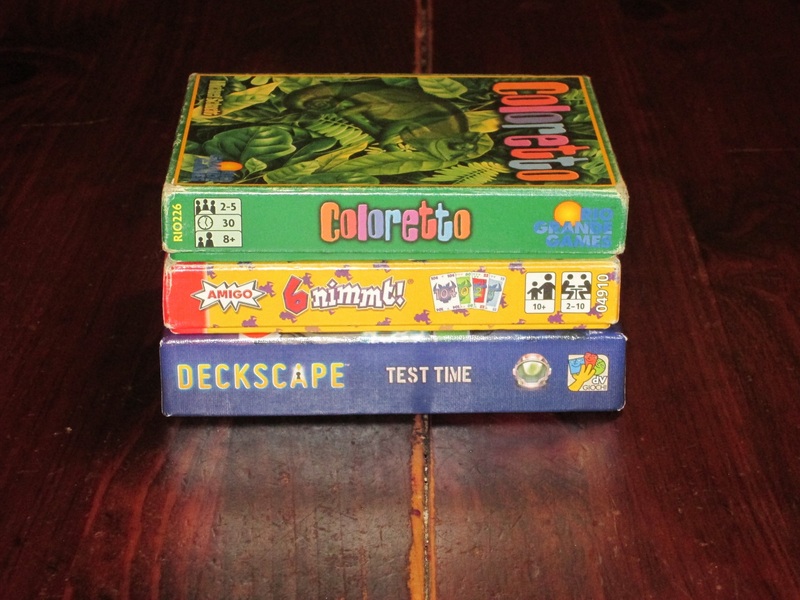 Deckscape comes in a small card box, the size of Coloretto or 6 Nimmt. The puzzles in Deckscape are fun, but some of them were super easy (to the point that only a brief look at the card solved them) and some of them we found very difficult. As with all escape rooms, the difficulty of puzzles, I’m sure, is in the eye of the beholder: some people can understand a puzzle (or at least a method for solving it) right away; a solution might never come to someone else. The trick is whether the puzzle makes sense once you know the crucial piece of information that provides the necessary perspective. In this aspect, most of Deckscape’s puzzles were fair–even though we might not have solved it as we should have, in most instances we recognized that the problem was our fault. There were only one or two puzzles that, even after we looked at the explanation, we still weren’t quite sure what we should have done. We enjoyed the puzzles in Deckscape, but there weren’t many puzzles that bowled us over with how clever they were, which is the main criterion in determining how much we enjoy a tabletop escape room. I think part of this is due to the prompt system, which made the puzzles seem a little like the puzzler page in a newspaper or magazine, almost a brain teaser instead of a multifaceted interactive puzzle. 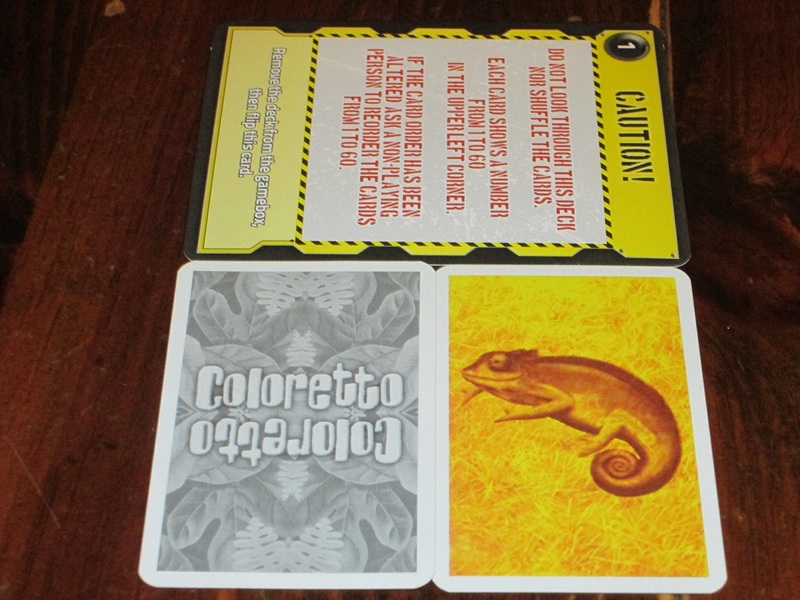 The Deckscape cards are the size of two Coloretto cards side by side. Even with the wild variability in difficulty and the lack of jaw-dropping surprise, we still enjoyed Deckscape because of the narrative that was drawing the experience together. Perhaps more than the other tabletop escape rooms we’ve done, there was a sense of cohesiveness here that united the puzzles into one game. I won’t spoil it, but the way Deckscape handled the ending was novel and exhilarating, and that’s the part that has my wife and I most excited about future Deckscape scenarios. It’s a clever way to break the (necessary) “on the rails” progression of escape rooms and offer players a way to make it their own. And even beyond the ending, the way the game handles multiple paths is interesting. While completing some puzzles is a necessary prerequisite to solving other ones, it seemed that with the deck split into different piles, there was more opportunity to follow our own path through the game. Deckscape’s insert. The large cards fill the box well. There’s not much wasted space here, which is great. Deckscape as a system is probably most comparable to Unlock!, another entirely card-based tabletop escape room, and while I liked a couple of Unlock! scenarios better than Test Time, I’d say the systems are comparable in terms of my enjoyment of them. Unlock! seems like a more polished product, but I was frustrated by the hidden numbers (and especially the gimmick of the Dr. Goorse scenario), and I prefer the complete box of a game like Exit or Deckscape, with no app required. (Then again, I might be the only person in my circle of friends without a smart phone.) Deckscape: Test Time, while perhaps not as slickly produced as Unlock!, is decent in its own right, but I think its strongest selling point is as a proof of concept for future scenarios. My hope is that future scenarios explore how far the system can go and offer more opportunities for cleverness and ultimately surprise and delight. So where does that leave us on Deckscape: Test Time? I liked it, but I didn’t love it. While it can be passed on once you’re finished with it (no components are “used up”), I’m not as eager to get my friends to play it because while the puzzles were fun, they weren’t overly clever or surprising. That being said, I still enjoyed myself, and I plan to try out the future entries in this series because there is a lot of potential in what Deckscape brings to the table. 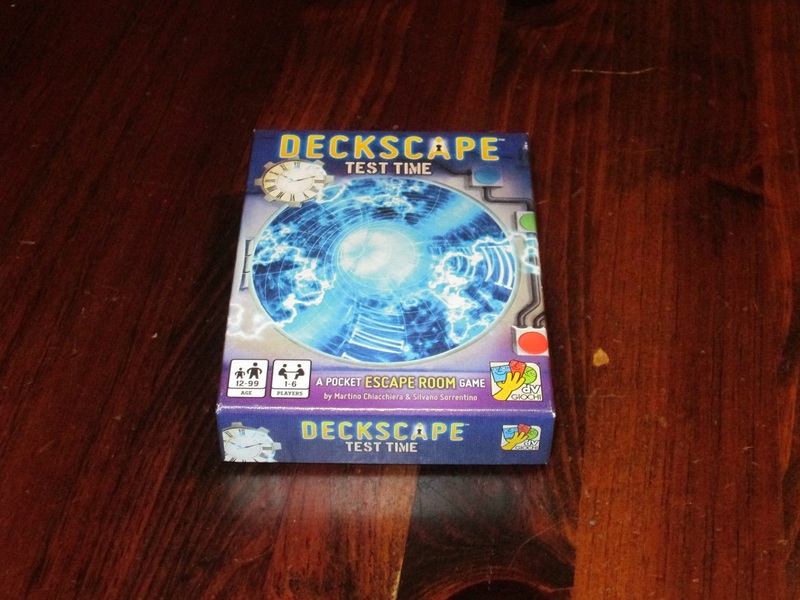 iSlaytheDragon would like to thank dV Giochi for providing us with a copy of Deckscape: Test Time for review.